Today was my brother-in-law, Joe's birthday. We had been planning for over a week to take him to eat at Epidors for his birthday. 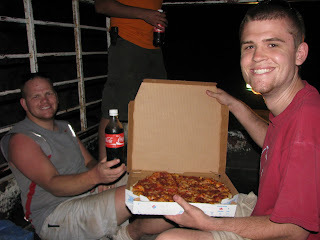 A treat after being in Haiti all week long - some pizza and ice cream. That morning Joe said something about how he was in Haiti and he wanted to eat Haitian food. He had no idea what we had been planning! :0) Needless to say, some plans were changed quickly in creole without Joe knowing anything. 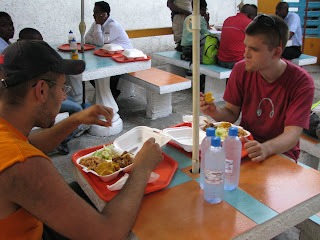 Roro took his good friend Phillip to the DR border. Phillip is starting to struggle with depression and he feels hopeless to help his sons. Roro spent the day with him praying and crying along with him. We went to the clinic for a little while. No food form the Jamaicans today. 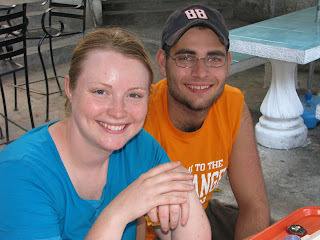 Sarah, Joe, Rick, Micheal and I went to Petionville for the afternoon. Sarah and David (our driver) found an authentic Haitian restaurant open that served goat! Exactly what Joe wanted to eat for his birthday! After we ate, we walked around and looked at lots and lots of paintings. I finally found one that I wanted to buy and we had to do the whole barting thing. The price started out at 100$ American and we finally worked him down to 35$ American. 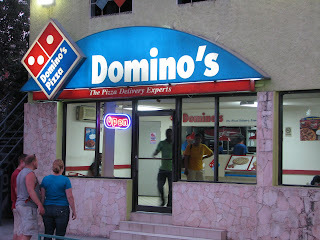 On the way home we passed by a Dominoes pizza. Well we stopped and Micheal bought 2 large pizzas and some drinks and paid 40$. I didn't eat any but they said it tasted just the real thing in the states!